New Delhi, February 9: Litigation fees should not create a "divide among the haves and have-nots", President Ram Nath Kovind said on Friday. He added that frequent adjournments, which are often sought only to delay cases, "are an inconvenience and a form of a justice tax on poor and less-well-off litigants". The President was speaking on the occasion of the presentation of the festschrift titled, 'Law, Justice and Judicial Power Justice PN Bhagwati's Approach'. 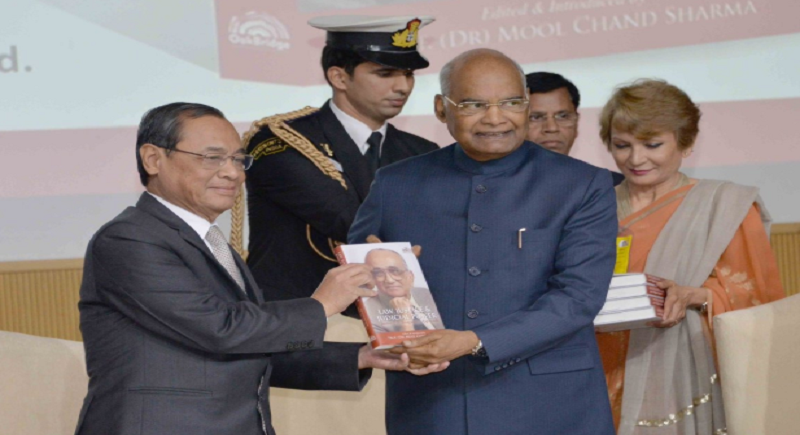 He received the first copy of the book from Chief Justice of India Ranjan Gogoi, who formally released it at a function held in New Delhi on February 8. This was a time when the judiciary came to recognise that the true judicial role of a judge is to transcend the boundaries of technocratic adjudication, and is to place himself or herself as a friend and protector of the poor and the oppressed." This leads him to speak about Justice Bhagwati being called the father of public interest litigation in India. Acknowledging the fact that PILs may be misused as well, he asserted that we nevertheless owe a degree of gratitude to Justice Bhagwati while viewing the mechanism through a broader lens. He further said, need for capacity support in the lower judiciary, and concluded, "All of this will take forward the work and philosophy of Justice Bhagwati and his generation of jurists – and will be a commemoration of the robust traditions of our independent judiciary, an institution of which every Indian is proud."